20' tall soccer ball. It can be customized with your logo for an additional fee. This inflatable soccer ball will accept a large banner. The balloon will also accept an interal light kit (sold separately) to illuminate at night. 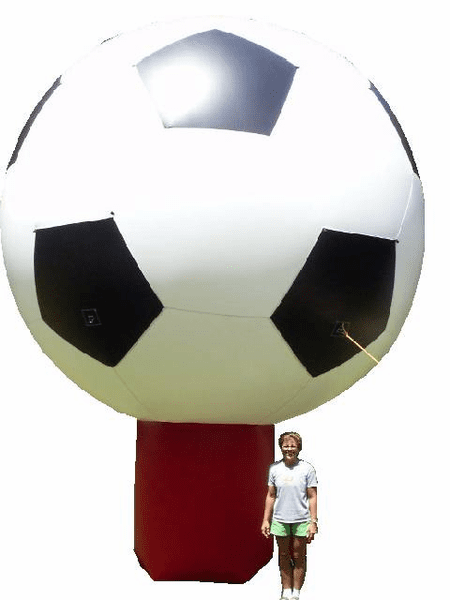 20' Giant Inflatable Soccer Ball for advertisng. Great for getting attention. Perfect for carnivals, fun events, school festivals, sporting events. This 20' GIANT Inflatable Soccer Ball WILL get everyone's attention. And like all of our balloons, before we send it out, it will be inflated and inspected. You will ALWAYS be satisfied with the products you order from us.